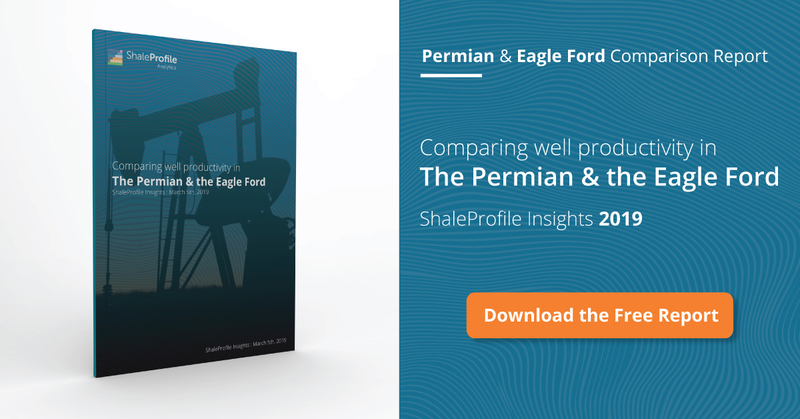 This interactive presentation contains the latest oil & gas production data from 19014 horizontal wells in the Eagle Ford region (TRRC districts 1-5), that started producing since 2010, through January 2017. As the graph shows, the steep production drop from March 2015 onward has almost halted since August 2016, and I expect that after revisions come in, production may show some growth again in the last couple of months. A little more than half of the decline since the March 2015 high has been replaced by new production. The production profiles for all these wells are shown in the “Well quality” overview. They are averaged, and grouped by the year in which the wells started production. So far it appears that these production profiles do not significantly change at lower rates of production (10-3o bo/d). The top graph in the “Well status” overview shows the number of new horizontal wells put on production each month in this region. New well additions have stabilized at a level of just over 100 per month, compared with over 400 at the end of 2014. The performance of the largest operators is visualized in the last tab (“Top operators”). Since November 2016 Devon Energy has ramped up well completions, which has lead to a significant production increase compared with the low in September. The “Ultimate Recovery” overview shows how all these horizontal wells are heading towards their ultimate recovery, as their production rates slow down over time. They are grouped by the quarter in which they started production. Over the past few years wells have been fracked with increasing volumes of proppant and water, which have lead to higher initial production rates. As you can see, this resulted in improved recovery trajectories, even though the shape of these curves haven’t changed much. If you click in the legend on the wells that started production in early 2014, you can see that more recent wells, although having a bigger head start, appear to decline slightly faster as well, which may result in giving back some of these early gains. The 2nd tab (“Cumulative production ranking”) ranks the counties in this area by cumulative production. You’ll notice that Karnes and De Witt counties have taken the lion share of oil production so far. If you switch to gas (using the “product” selection), you’ll find that Webb county is clearly leading in gas production.